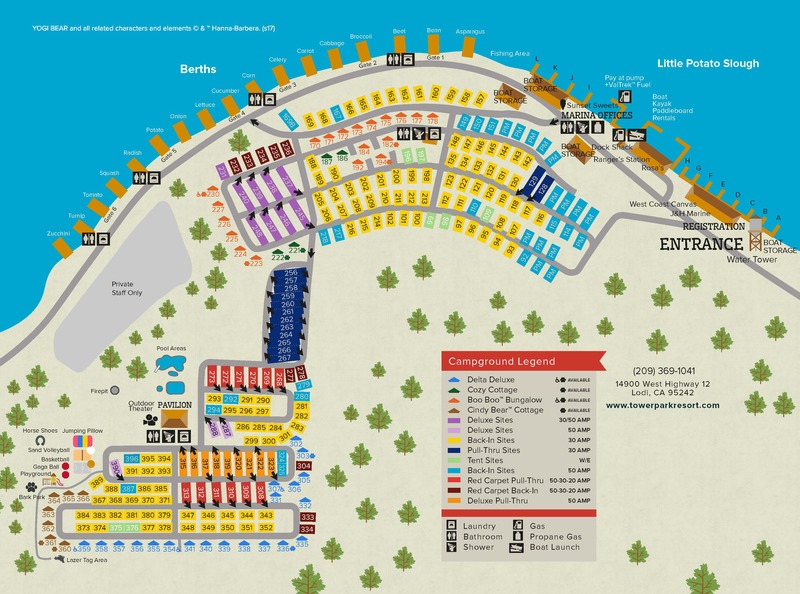 Ask fellow campers about "Yogi Bear's Jellystone Park™ Camp-Resort: Tower Park" and nearby attractions. Crowded park. Seems to be family friendly, lots of activities for kids. Noisy at night, dogs barking, kids screaming. Do NOT try to check in before 3pm or they charge you. The sites that are dirt are relatively clean. Be careful driving through children are on bikes and driving golf carts everywhere. We camped at Yogi Bear's Jellystone Park™ Camp-Resort: Tower Park in a Travel Trailer. The water park is under construction. It looks like it will be wonderful for families. We were in spot 3 in a newer section of the park close to the reservation department. Our spot was a large pull through site with concrete pad and patio area, fire pit and a BBQ. Initially we were in 257 - a big dust bowl no trees so no shade and very limited lawn area. We had 5 trailers total with toddlers and animals in the group. These spaces would not work for us. The reservation department was top knotch. They were able to move us to some great spots with a smile on their face even while they were so very busy. Spot 257 will be great because it is across from the new water park but, for now, not good. This was our second time to the park and we will be back. They give you a beautiful dog treat for each of your dogs at check in. When we were there the bar and grill did not have a liquor license but they said they should have it shortly. We had tacos for lunch. The food was wonderful. So good we ordered dinner and brought it back to our camp site. We camped at Yogi Bear's Jellystone Park™ Camp-Resort: Tower Park in a Travel Trailer. This is a park which seems to be designed for children as it has many activities and amenities for families. We were only able to book the deluxe 30/50 amp site which was very pricey. That said, the site was extra large with a well-established shade trees. There was also a cement patio with some metal patio furniture provided. There really was no grass between sites but mostly weed and dirt. All of the connections were convenient and worked well. There was adequate over-the-air television and Verizon and AT&T cell service worked well. It has fairly easy access on a good road from I5. The RV area is actually a short walk to the Delta area. There is a restaurant on site as well as a coffee shop which is open only on the weekends. We did not swim in either of the pools but they were very popular. The dog park is fence well and fairly large. The park was mostly empty mid-week but completely full for the weekend. We camped at Yogi Bear's Jellystone Park™ Camp-Resort: Tower Park in a Fifth Wheel. This park's former name was "Tower Park KOA". it is a part of a marina that provides access to the Sacramento Delta. The staff were all very friendly and helpful. The overall idea of the park is good, if you have younger children and/or have a boat. We had neither. Therefore, this was a very overpriced park for what we got and what was available. Our campsite was a nice and level concrete pad with full hookups. The cable TV connection did not work. The worst part about the site and our overall stay was the horrible stench of sewage throughout parts of the park, which included our campsite. There was a sewage pond about 150 yards from our campsite, so the entire area was stinky. I recommend reserving a spot closer to the playground equipment; the stench did not seem to make it to that area of the campground. We camped at Yogi Bear's Jellystone Park™ Camp-Resort: Tower Park in a Travel Trailer. This park has been recently renovated and overall the renovations are excellent. Electric worked well and no problems with sewer or water. Many sites have concrete pads, there is a nice dog park, and the pools are in very good condition. They also have play structures and a big bouncy inflatable for kids. They gave us "express" check-in: i.e. we followed one of their staff to our site and then could do the paperwork later. Overall, the staff was very friendly, no complaints there. Problems we had were: cable not working, docks usable but needing renovation, and there was a big tree branch sticking out into our site that meant I had to back in very carefully and orient myself in a certain way to avoid hitting it. So, they need to go around and trim branches from the sites. For what they are charging, they need to do better with that. We camped at Yogi Bear's Jellystone Park™ Camp-Resort: Tower Park in a Motorhome. Facilities in the park are good for swimming, kids, pets. Way overpriced. For that money, we expected something decent; but, we were tired and took the last space and this full park looked like a beehive. Lots of rigs crammed into lots of small spaces, ours a narrow pull-through with grass/mud on either side. As this is March, it might play better in summer, but $68 for this dreary, wet, no-view crowded place is a joke. Oh, and the old, rusted humming electric power transformer 3 feet from our rig didn't impress either. We camped at Yogi Bear's Jellystone Park™ Camp-Resort: Tower Park in a Travel Trailer. After reading all the negative reviews, we were somewhat hesitant about booking a stay, here. We're happy we did! The park is beautiful with mostly grassy, tree-covered sites. We had a friendly greeting upon arrival. When we saw some sites without trees, the front desk people happily moved us so that we could get a little more of the winter sun. The there's a good sized dog park, a grassy field, kids playground, and outdoor pools (closed for winter). The water stopped working our 3rd day there. By the time I made it to the office, they were already working on the repair and had begun hand-delivering free cases of water to every site. Other signs of good management were new rail fencing around the jumping cushion, and new sewer connections going into the east side of the park. The pull-thru site we were in was designed to allow travel buddies to have their doors facing each other. But the sites were so long, that you could also pull all the way forward to get more privacy. We'll be back! We camped at Yogi Bear's Jellystone Park™ Camp-Resort: Tower Park in a Motorhome. Lodi dining: Town & Roses, Dancing Fox, and Zin Bistro were all good. Lodi wineries - just 20-30 minutes away. My review of this site is based on my experience in attempting to cancel reservations. My wife made reservations here based on the web site photos and description. After multiple people from the area warned me about the drugs and crime associated with the trailer park attached to this park (nothing in the website about that by the way) and being warned that if I have a gun I should bring it....I decided to check the place out myself in advance. I could not drive directly into the park itself but could see quite a bit of it from the parking lot above it where the store and check-in area are. The trailer park looked pretty much as described by friends, there was lots of debris and trash behind many trailers and the inflatable kids giant pillow mentioned in the ads was deflated and covered in stagnant water. At that point I saw enough to know I did not want to stay there. My wife called to cancel the reservations and was told that she could have 50% in store credit??!! When she complained and asked for a manager, she was told one would call her back the following day. Nobody called. She did follow up the next day and was told that the manager "Paul Kraft" said that "rules are rules" and that's the way it is. We are currently following up with the corporate office that owns the campground. I DO NOT recommend staying here or dealing with this campground. Terrible attitude and service. Management could not care less if they tried. We camped at Yogi Bear's Jellystone Park™ Camp-Resort: Tower Park in a Motorhome. We stayed here while our truck was in the shop. Great restaurant, live music on weekends, very nice & helpful staff. We camped at Yogi Bear's Jellystone Park™ Camp-Resort: Tower Park in a Travel Trailer. Since we had no vehicle I can't speak for the surrounding area but we had all we needed at the park with a store, restaurant & bar!! Met the new owner and seems he's doing a great job here. Pleasant surroundings. I hate rating "poor" but to be fair to the other 8 parks we stayed at on our trip, this was the worst and a HUGE letdown. Thought a "corporate" KOA "Resort" would be super nice, but this one is awfully poorly run. Restrooms were very dirty with muddy floors and tp & towels all over. Lots of cobwebs all over the buildings and in the restrooms, many with live spiders on them. NO WIFI and when asked the office person said "Yeah it is really bad Internet here". Dirty trash cans ) all over the outside), tons of kids in yellow KOA shirts buzzing all over on golf carts doing nothing, and only 1 fishing boat and 1 patio boat for rent???? Sorry but would not return here due to the overpriced rate of $80 per night for dirty rundown campgrounds. Sad! We camped at Yogi Bear's Jellystone Park™ Camp-Resort: Tower Park in a Travel Trailer. Absolutely disgusting even at half the price. Dirty, overgrown with weeds and dead foliage, insect infested (spiders). Way off freeway, not easy in or out due to road work. Staff preoccupied with their own conversations and jokes. Poor, Poor, Poor. KOA is making money, but it is not going back into the parks. Will Never return to this dump. We camped at Yogi Bear's Jellystone Park™ Camp-Resort: Tower Park in a Travel Trailer. This is the dirtiest KOA I have ever been to. Paid $80 a night ,and our site is littered with cigarette butts. In walking the dogs, I see that all the other sites are the same. Trash littered everywhere. Will not return. We camped at Yogi Bear's Jellystone Park™ Camp-Resort: Tower Park in a Motorhome. The lower area (near the pool) is dominated by families with kids; lots of kids running around having fun in the pool and on the big bouncy thing, adults drinking lots of beer. The area closer to the water (older section) has nice big trees, shade, and a much quieter vibe. The pull through sites are basic, with minimal landscaping. Wi-Fi was weak where we stayed (in the older section). This place is geared toward the power boating set. We camped at Yogi Bear's Jellystone Park™ Camp-Resort: Tower Park in a Motorhome. We love coming to the Stockton Delta KOA. We come here every year for our family reunion. This is a wonderful facility with a well stocked store and great activities for the kids. Many of the sites are well shaded. One of the draw backs to tree shaded sites is the grass doesn't grow very well and then there is some dust, but we'll take cool camping over hot camping any day of the week. We camped at Yogi Bear's Jellystone Park™ Camp-Resort: Tower Park in a Motorhome. Parked here to see the Military Show before going to the coast. Park was full of kids so the noise was up, which should be expected with kids around. The play area and pool were great. The trees provided lots of shade which meant no grass, just dirt under the trees. Someone before us left their ashes on the ground next to the tree, which our 3 yr old granddaughter quickly found. (Thanks SO much.) The staff was constantly keeping up with cleaning due to the park being full. We enjoyed ourselves and will come back. We camped at Yogi Bear's Jellystone Park™ Camp-Resort: Tower Park in a Fifth Wheel. Lodi dining: Town & Roses, Dancing Fox, and Zin Bistro were all good. Lodi wineries - just 20-30 minutes away. 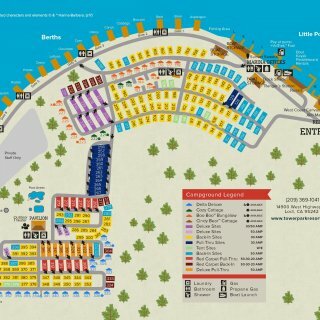 Are you affiliated with Yogi Bear's Jellystone Park™ Camp-Resort: Tower Park ?